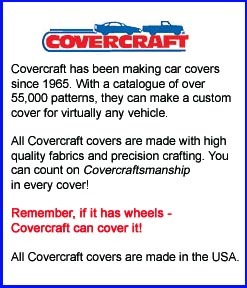 The Covercraft Tan Flannel Car Cover is available in over 400 custom car cover patterns from Covercraft. An indoor cover with a soft natural finish to protect delicate paint. Favored by traditional enthusiast, tan flannel always provides a soft touch to pamper fine paint finishes. Designed primarily for indoor storage use, this woven cover is constructed from a durable polycotton blend. This fabric is a heavier version of Covercraft's Polycotton cover. Long Wearing - Over 50% heavier than our gray polycotton fabric. Breathable - Allows moisture to evaporate and will not trap heat under cover. Rot, Mildew Resistant - Treated to resist rot and mildew. The flannel cover is intended for indoor use or occasional outdoor use. The napped underside pampers delicate paint finishes and the strong, polycotton fibers provide good dust protection. This is a heavier fabric so it may be best suited for long-term storage. If you want a lighter indoor cover, check out the Polycotton cover. The Flannel cover is available in tan.